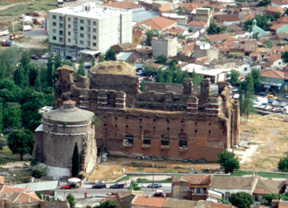 At the southern foot of the acropolis is a large ancient religious complex called the "Red Basilica" (Turkish: Kizil Avlu). The complex was built during the reign of the emperor Hadrian (A.D. 117–138). Most scholars believe that the deities Serapis, Isis, and Harpocrates were worshiped here. During the Byzantine period it was turned into the Church of St. John. The building measures 200 x 85 ft. [60 x 26 m.] and in some places stands to a height of 62 ft. [19 m.].